After nearly a year exploring South East Asia, Australia, New Zealand and that part of the globe we made our way to the Mediterranean a couple weeks ago. The lush, green, wet heat of Bali became the arid white breeze of Folegandros. P and I first went to Folegandros, a sleepy island in the Greek Cyclades, on our honeymoon years ago and we fell for this island with its steep cliffs crashing into dark Mediterranean waters. Not much has changed. In the evenings people still stroll around the whitewashed old town square, then eat delicious suppers under almond trees strewn with lights. I didn't think I could love a place as much as Bali, but Folegandros is equally dreamy for me. This may sound silly, but I think my half-Greek blood has me feel instantly at home in the Mediterranean. The smell of grapevines toasting in the sun, the stunning light, the flavors at the table. I love it here. Every day last week, Paul, Otis, Lilah, and I took the funky white and blue striped public bus to a little pebbled cove a few miles from town. Paul taught the kids to skip rocks while I devoured Keith Richard's autobiography. I apologize for not having a recipe to share with you today. I haven't cooked since we left our Bali house, though we have eaten like royalty - actually more like happy peasants. 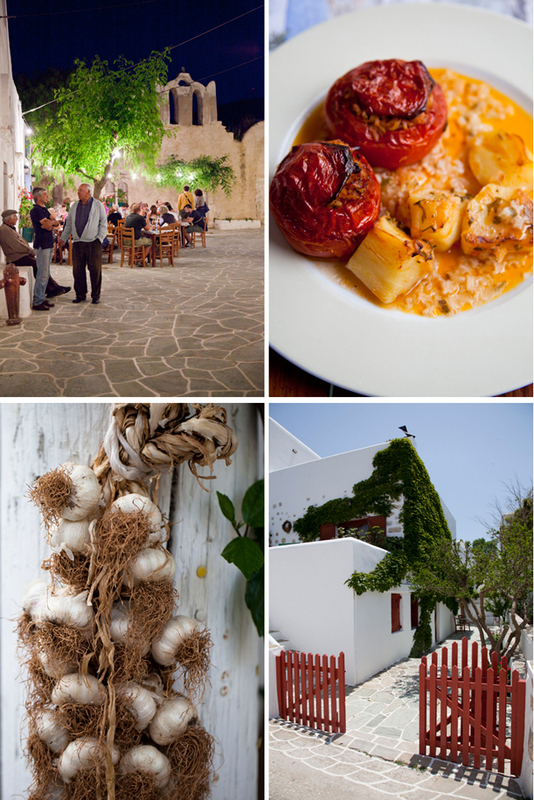 My favorite Greek food is the rustic, grandma-style cooking that still seems to dominate taverna menus. We scarfed succulent meats, long stewed in local tomatoes, olive oil, and herbs. Greek salads filled with tangy local feta, juicy tomatoes, crisp cucumbers, and fragrant red onion, and a generous drizzle of olive oil were a daily necessity at our table. Sweet stuffed tomatoes with rice and oregano and thyme were perfect, as were the tatziki and fava spreads. We snacked on local almonds, firm red cherries, and plump apricots with plenty of creamy yogurt drizzled with honey. I am itching to get back to my Berkeley kitchen, bust out my grandmother's old dogeared Greek cookbooks and get cooking. Do any of you have any Greek recipes or cookbooks you adore? Please share with us if you do! For a while now, I've been eying Vefa's Kitchen. I'd love to hear from anyone who has tried it. Greece is my favorite place in Europe, love its food, culture and laid back people! Thanks M! I love it too. Greece is so amazing - the food, the people, the landscape, the water.... I really love it all. I've been looking forward to these photos so much, and oh, wow. They're even more beautiful that I imagined. I've never been to that part of the Mediterranean, and I'm also never cooked Greek food. But I suddenly feel very inspired to do both! Thanks Emma! What a sweet comment. You really made my day. And I'm so glad you are inspired to try cooking some Greek food. When done right, it is remarkably delicious. Such charm! You just can't take enough photos...every corner is worth a picture. We loved our trip to the Greek Islands. And the food, oh my! Have fun! Barbara - it's too true. Greece is ridiculously photogenic. And the light here is magical! Love, love, love you blog and photo. Being expat Aussie in NYC I have ousted after all the recipes and place you travel on my old doorstep! Txs. A must for your bookshelf is 'Crazy water, Pickled lemons' by Diana Henry. Whilst it is not Greek, it is mediterranian/middle eastern. Every recipe is fabulous. It is definate favorate of my sister and I! I am sure you will love it too! E just has the touch with the camera. The photos will help me remember just what an amazing spot we had there. jennharro - Thanks so much for the cookbook suggestion! That's a new one for me and it sounds perfect! these photographs are just AMAZING!!!! please hurry and open your granny's cookbook as my mouth is watering from this post!!!!!!! oh man, girl. gorgeous. gorgeous. gorgeous. i like to give vefa's kitchen as a gift. people love it. sounds like a good welcome home gift to get for you. I must have been Greek in another life. I love the way they use figs, meat wrapped up in fig leaves, and all the fresh fava's which is also a Portuguese yummy thing I remember as a kid. I just love Mediterranean food period. All very fresh and delicious. Can't wait for more pictures as I don't get to travel. You are going places I will never get to go to and you travel my style. I am curious if they have much problem with celiac there since their foods are so clean. Erin your pictures are gorgeous! Can't wait to see more! I LOVE your Greek photos. THey bring back so many memories of smells and tastes. Can't wait to see what you post when you get home. Ap - thank you! Such sweet praise. Phyllis - so cool that you are a fan of Vefa's. It looks fabulous and I need to get into a Greek cooking groove. Miss you! Oli - I know. The Mediterranean cuisine really has it right. So simple, fresh ,comforting. I just heard about lamb baked in fig leaf. This I'd love to try! For the most part, Greek food is GF friendly, but I have gotten some traces of gluten that have left my belly badly aching. Eating out is always tricky. This is why I am so excited to bring ideas home to my own kitchen so I can enjoy the Greek flavors and keep my belly safe too. Jill and Megan - thanks so much! All the photos are so beautiful! I've never been to Greece. Your pictures make me want to go even more! Oh and thank you for leaving a comment on my blog :). I am in love, love, love with your blog. It is going straight to "my favorites" side bar!! Happy travels. We are hoping to hit the road soon!! Sarah, such a kind comment. Thank you so much!!! 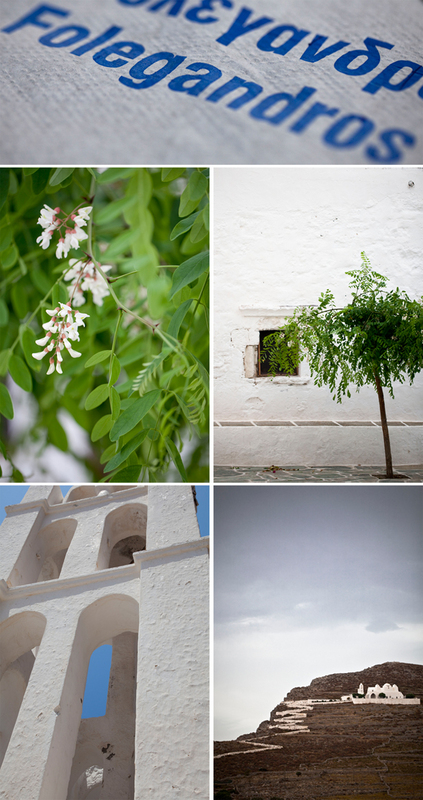 greece has been on my shortlist of places to visit, thanks for the beautiful set of photos. i'm sure you're loving istanbul. one recommendation that i have (not on my blog) is ciya on the asian side. we didn't make it there on our visit and have been regretting it as it's highly regarded as beining one of the best places to eat in istanbul. can't wait to see your photos! Rick - thanks for stopping by! Funny you should mention Ciya. I read about it last year in the New Yorker and have wanted to go ever since. Plus it seems to be everyone's favorite Istanbul spot. We are going to make the trek across the river and I'll let you know it if lives up to the hype. And Greece is pretty dreamy - definitely worth a trip. I hear Sifnos is especially good for foodies. All I can say is: take me with you!!!! Wow! I've had Greece on my travel list for a while...I think your pics just pushed it to the top if the list. Stunning. (Also had Keith Richard's book on my reading list -- too funny.) Keep the photos coming! Love it. Oh...your photos bring back such pleasant memories. My knees buckle when I see white-washed buildings and turquoise shutters. And then my mind goes right to the food served at each beach taverna: light, fresh and full-blown Mediterranean flavors. I've been looking for a good Greek cookbook, so thanks for pointing me in the direction of Vefa's. Stephanie, Allison and Lori - thanks so much!! What gorgeous photos - I felt like I was sitting there, enjoying delicious feta and cucumber salad, looking at the sea. Always a pleasure to come and visit your site. What fabulous pictures! Greece is one magnificent country. Rosa - thanks:) Greece really is terrific! Lots of greetings from Greece ! I do hope everybody in good health, I miss you ! Fanis! So great to hear from you. We miss you too. you're brilliant. keep it up.. Much love from Cleveland, Ohio.